Tone 13 is the Day of Ascension. This is a day to Celebrate a Transformation to Higher Consciousness. The Monkey/CHUEN trecena inspired us to see our Self as a Creator with Divine Authority. The Seed/KAN trecena offered a Journey through which we could apply this Truth to experience the reality of walking in integrity with our Divine Design. Wisdom/CIB is the Day Sign of the Old Ones who held the light aloft as the Wisdom of their experience. The CIB glyph illustrates a mind in its Highest State of Consciousness. The emanating rays illustrate the minds search for Truth and Wisdom that is only made possible by Forgiveness. We emerge today from a Portal that allowed us to see more clearly from the perspective of Spirit. Today we will see the Truth of our Transformation in the reality of our Human experience. We can always know the True State of our own Consciousness through the measure of our forgiveness. Forgiveness is a necessary condition for Divine Discernment. The lesson of Wisdom/CIB and the Ancestors reflects on our Source of Wisdom within. We are told that all the experiences hold more potential for Wisdom than any archeological treasure. Through an Ascension to Higher Consciousness, we’re given the Wisdom to measure our progress by current state of Forgiveness. We can never rise to a Higher Level of Consciousness focused on someone else. The very process of Transformation is a Self-Realization. To walk in the Wisdom of our Integrity to our “next generation” of Spirit, requires that we focus the Light on our Self. Seeing how our the behavior from our Human Nature is always in need of forgiveness, we can be more forgiving of others. We won’t be afraid to accept the blame when we live in our Highest Consciousness of the Creator. Wisdom is a Gift that allows Human to hold dominion in the world. We were given the power to contemplate the future and the past, and to even imagine things that have never been. In our Highest State, we’re free from the Rule of our Human Emotions. We can see how feeling are helpful in our Discernment of Truth. Residing in Unconditional Love, we no longer have to be confused about whether our decisions “right” or “wrong.” We only have to consider the Wisdom of our experience, and the Wisdom handed down by our Elders to discern when our decisions are Wise. The Wise decision will always move us another step forward in the right direction. Our discernment is easy when we can look at our choices in the Light of our own Wisdom. A lack of forgiveness clouds the field of our perception. We are side-tracked by the judgement of injustice. We might hesitate to forgive, wasting our time in the Human Discernment of the “wrongness” of another, and whether they deserve to be forgiven. We make it harder to see the simple Truth. We are all flawed. We can make no progress on our own flaws, when we place the blame on another. However, it’s easy to know the next Wise thing to do. Detached from our resentment, we can be pretty clear on whether the direction we take will advance the cause of Love, or set us back in an effort of Right Relationship. We can’t experience our Self as Light while we’re casting darkness on another. Only through Forgiveness can we have the confidence that we are seeing things clearly. We we can see the things we haven’t forgiven, we’ve found a treasure of Wisdom within. We can see that our points of Unforgiveness are the very stones in our way on our path to Consciousness. We can clear our own path forgiving them one-by-one. Every time we see fault in another, there is a new stone to be turned over… a new mystery of Wisdom that can be discovered by looking at the fear that lies beneath it. The Seed/KAN trecena has presented us with the Consciousness of our Divine Design. We learned how things were designed to work to accomplish our own Transformation. Human’s destiny is to bear the journey of time. Our Human Nature reflects the Darkness to be transformed by Light, and our Spiritual Nature brings Light to transform the Darkness. We can forgive our Self each time we discover fault within our Self. We could see that the Discovery itself is the Accomplishment. The Discovery of our Human flaws no longer has to be discerned as a setback. Instead, we can see it as the very Light held aloft on a path to Wisdom. On the Tone 13 we stand at the peak of a new Summit. Through forgiveness we are prepared for dynamic progress ahead. Today is a day to imagine the Higher Horizons of Consciousness we are now capable to climb. We can clearly see how Forgiveness is an element of the Divine Plan that makes our own Transformation possible. 13 is the number of creation and theurgy – our ability to be of One Consciousness with the Creator through Sacred Ritual and Ceremony. On our Ascension of Wisdom/CIB, our Consciousness is raised to all our Sources of Wisdom that are present for us to know the next Wise thing to do. 13 is the number that reflects our access to Divine Discernment. When we can’t see the way forward, we can depend on a Divine Agency to intervene when our Highest Intention is to know the Truth, especially when the Light will reveal our own Fault. Through Higher Consciousness we don’t have to learn the same lessons over and over again. Embracing the Truth of our Darkness it can be disappeared by the Light. To all my relations, may we Honor the Grandfathers and Grandmothers, the Ascended Masters, and all those that have walked the “hard road of life.” May we acknowledge the value of the Gift of their Wisdom. May we see that they laid a path we can follow on our way to discovering our own Truth. May we see all the stumbles we avoided by stones they cleared from our path. May we give thanks to the Creator for the dynamic nature of our experience and the discoveries we could make. May we give thanks that Human always has something new to reach for. Each day unveils a Higher Meaning and Purpose to live for and the potential for new Miracles of Understanding. May we celebrate our Ascension in the company of the Ancestors, Knowing they would be present at a Celebration of the Wisdom we will carry on. I’m sharing a the “21-Days of Gratitude” as a perpetual Personal Ceremony through the next journey to 8 Monkey/CHUEN Maya New Year. This 21 days started on 11 Jaguar/IX and ends in synchronicity, on 12 Jaguar/IX – 12’s Tone of Understanding, the Magic of Gratitude (Jaguar/IX). We are approaching the Global Burner Day, 4 Sun/AHAU, on December 15th. 4 Sun/AHAU a very significant date on the Tzolk’in calendar, central to Mayan prophecies of Transformation. (December 21, 2012 prophecies were based on its Mayan date, 4 Sun/AHAU.) Burner Days release a build-up of residual energies to restore the Balance of our Relationships. Personal ceremonies are often observed by the Maya during days leading up to Burner Days. I’m grateful for the Old Ones that know first hand our experience of living. I’m grateful they are the evidence of our Power to be Transformed. I’m grateful that when I find resentment within myself, I can celebrate a discovery of a valuable Spiritual Treasure. I always enjoy reading your texts. I am grateful to Divine Providence for putting me on the path of the ancient wisdom of the Maya. Best greetings from France! Gratitude. and question. I stand in the portal born 10 Ben. Been following your way as I made my own to commitment this cycle. I am experiencing a shift of “reduction, refinement, or minimalization?” . I KNOW the connection is still there; however, the intensity for which I was experiencing it has somewhat diminshed. I have sense memory of the incredible connectedness. 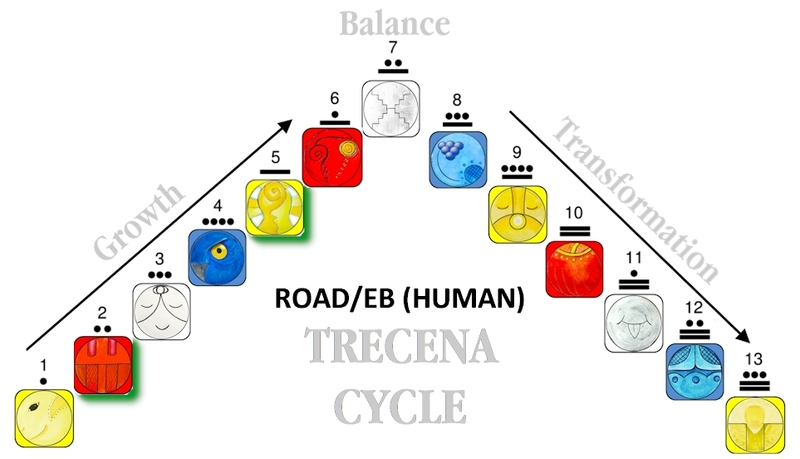 Given the natural cycle, can that level be maintained throughout the cycle of days or or is ebb/flow part of what makes up the last tracena?